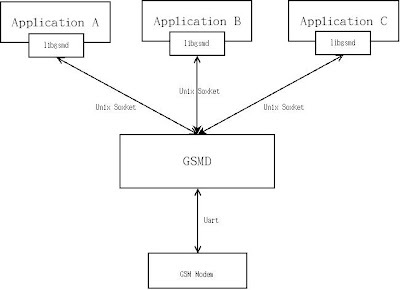 Gsmd is a daemon that handles the communications between applications and GSM modem. Applications manipulate gsmd through the APIs defined in libgsmd. libgsmd communicates with gsmd through unix socket, and modem goes through UART. The diagram is as following. GSMD is an event-driven daemon. Each event shall have a response and will pass through the function gsmd_select_main() in which finding and then executing their correspond callback functions. The last part of gsmd main function enters a infinite loop, trying to call gsmd_select_main. All command will synchronize wait for a response until timeout. All callback function of command with multiple line responses are re-entry able. Commands of specify modem will put in vendor plug-in. Commands or some special scheme for specify platform will put in machine plug-in. gsmd_select_main this is core of the callback function scheme. All devices, gsmd monitors and linked in a list, are described as a struct gsmd_fd, and gsmd_select_main will select them. Once an event comes out from one of the devices, gsmd_select_main will try to call it's callback function that devices registered. When there are anything change in fd, the gsmd_select_main will detect them and try to call it's callback function cb. That means if you redirect the callback function cb to another implementation, the gsmd will behave very differently. Gsmd opens at least one devices. One is uart to modem and others are the Unix socket, communicating with libgsmd. atcmd_select_cb is the default callback function that dealing the UART to the modem. It will handle sending AT commands to GSM modem or receive whatever return from modem and send them into parser. The default parser callback function of UART (to modem) is ml_parse, in which dealing with reading the response from modem and dispatching the correct callback function to handle the response. There are two queues that handles the atcmds. One is pending_atcmds, and the other is busy_atcmds. pending_atcmds links all the atcmds user send to gsmd in sequence and those commands are not send to modem yet. busy_atcmds links all the atcmds sent to gsm modem but not get the response yet. Both pending_atcmds and busy_atcmds are FIFO queue. If there are atcmds in pending_atcmds queue, the atcmd_select_cb will be called in WRITE mode. It will try to write the atcmd at the head of queue to modem, and move this atcmd handler into busy_atcmds queue. When the modem firmware is ready to initial, it will send AT-Command Interpreter ready to gsmd. If ml_parse get this string, gsmd will try to initialize the modem. What modem write to gsmd will put in "buf". And if the contents of the "buf" is "AT-Command Interpreter ready" the automatic gsmd initialize will start. gsmd_alive_start is a scheme that gsmd detect if the modem is still alive or not. It will send an "AT" to modem periodically, and check the modem's response. If modem does not send out "AT-Command Interpreter ready", gsmd will still be initialized by the callback function (firstcmd_atcb) of ATZ. libgsmd is a library with C language API for application programs. Programs using this library can use the phone, e.g. make phone calls, receive incoming calls, register to the network, etc.